Sage Software North America has just opened registration for their online Sage Summit Virtual Event to be held on November 18, 2010 from 10am to 1pm ET. This three hour session features an update from Sue Swenson, CEO Sage North America. In addition those customers attending are being asked to review up to 40 different pitches for sessions that they’d like to see presented at the official Summit 2011 conference in Washington DC July 10-15, 2011. According to the Sage Summit Virtual Event registration page customers will view brief presentations made by product managers and then vote (How voting works) on whether they’d like to see those presentations made into full sessions to be delivered in July at the Summit Conference. Sage Summit is the conference for the Sage community – bringing customers and partners together for the first time ever. The conference will take place July 10-15, 2011, in Washington, DC. This gives you an unprecedented opportunity to interact with customers more closely than ever before. 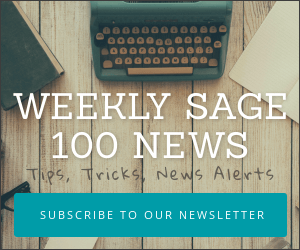 The agenda listed by Sage appears to be subject to change as at least one executive listed, Jodi Uecker-Rust, has departed Sage and is not likely to be making an appearance. Gathering customers together to vote on sessions for an upcoming conference is a new idea for Sage. This is the first time we’ve seen it done and clearly this looks to be a way for Sage to continue to test the virtual conferencing waters. Sage previously hosted a Connecting The Dots virtual exhibit on September 28 which seemed to use similar online conference technology. 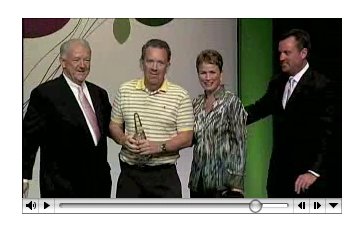 If you’re a Sage customer who is on the fence about attending Sage Summit 2011 in Washington DC – this is a good way for you to get a feel for and vote on some of the topics that would be covered at the full conference in July 2011. 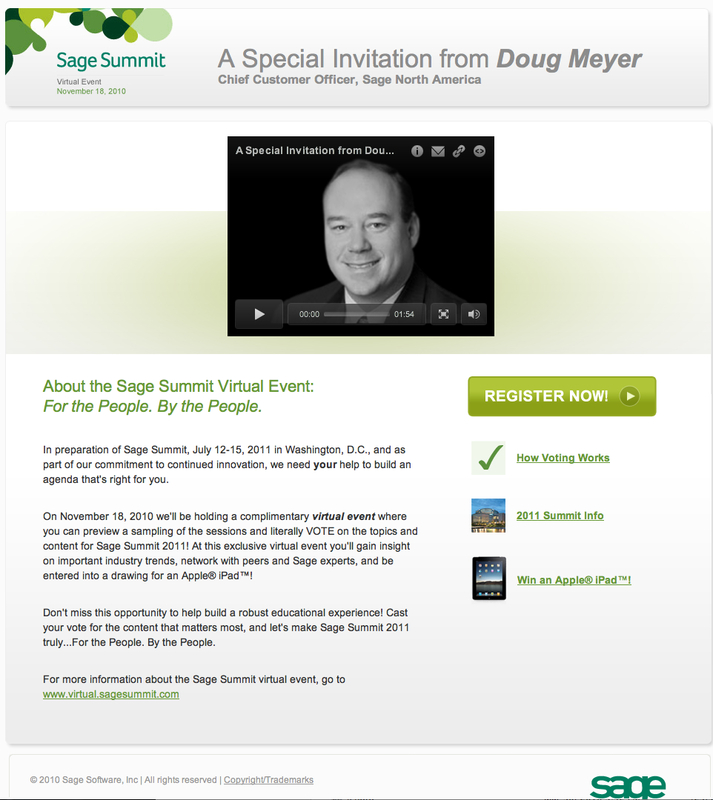 To provide a robust education experience, Sage customers are invited to attend a complimentary virtual event on Thursday, November 18, where they can preview a sampling of the sessions, vote on the topics, and share their thoughts on how we can make Summit 2011 really work for them. Registration is now open, so be sure to spread the word about this one of a kind opportunity your customers won’t want to miss! Sage just posted links to all of their keynote videos from their recent Insights 2010 conference held in Denver Colorado May 17-20, 2010. This is the first time that I’ve noted the videos being available online and think it’s a great idea for Sage to share these presentations for those who otherwise were unable to make the conference itself. Most of the value of Sage Insights conferences are the networking with fellow consultants and comparing notes with what’s worked well in your business for the last year as well as asking your peers for advice on what new strategies they may be planning for the coming year. Even if you’re not actively using Wave at Sage Insights 2010 (and if you’re interested here’s how) we’ve embedded the live Google Wave of Jodi Uecker-Rust, Himanshu Palsule and Tom Miller. They’ll talk today about the opportunities ahead for the Sage channel partners and the end user as well.